Integrated Transportation and Capacity Assessment | Resource Systems Group, Inc.
Yosemite National Park ranks among the most heavily visited national parks in the United States, accommodating approximately four million visitors annually. 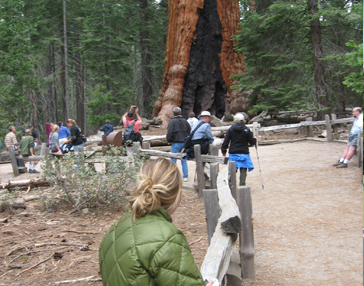 Much of the park’s visitor use is concentrated in Yosemite Valley; the valley comprises merely four percent of the park’s total area, yet accommodates 98% of all park visitation. Furthermore, one-third of all park visits occur during July and August. 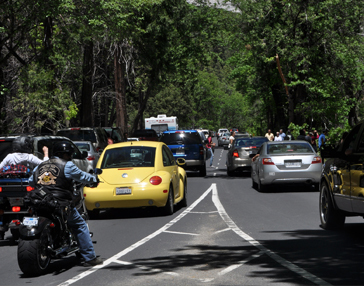 Consequently, Yosemite Valley experiences severe traffic congestion, parking shortages, and visitor crowding during the summer months. RSG worked with the NPS to develop and apply an approach to integrate transportation planning and user capacity management in Yosemite National Park. RSG developed statistical and simulation models of vehicle traffic and visitor use to assess relationships among inbound vehicle traffic at park entrances, visitor use at recreation sites in Yosemite Valley, and crowding-related capacities. 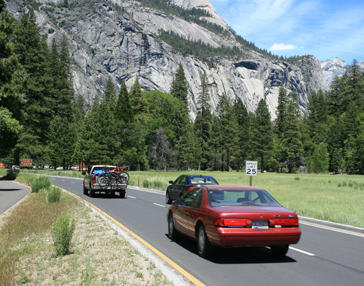 RSG conducted simulations to estimate inbound vehicle traffic capacities, beyond which there would be unacceptable crowding in Yosemite Valley. The NPS is using the project results to help evaluate potential carrying capacities in the Merced River Plan, which will guide the long-term management of visitor use, transportation, and recreation facilities in Yosemite Valley, and is among the most high profile and controversial NPS planning projects.